Here’s a different way to use fresh Brussels sprouts. It’s tasty and can be served over rice or pasta as a main dish or alone as a side dish. It comes together in minutes, too! Spray or brush a non-stick wok or large skillet with a light coating of canola oil. Heat over medium-high heat, and add the garlic and green onions; stir and cook for one minute. Add the Brussels sprouts, turning them cut-side down. Cook until lightly browned, about 3 minutes. Remove the cover and add the soy sauce and rice wine vinegar. Cook and stir for about one minute. Add more soy sauce or rice wine vinegar to taste and serve hot. Nutrition (per serving): 116 calories, 4 calories from fat, <1g total fat, 0mg cholesterol, 220.7mg sodium, 680.6mg potassium, 24.4g carbohydrates, 5.5g fiber, 5.8g sugar, 8.7g protein, 3.7 points. Some of you may notice that this week I am lightening up my menus a good bit (yes, even “fat-free” vegan food can sometimes be heavy). While I need to lighten up my meals, my husband and daughter do not, so I’ve been making some adjustments to the dishes I serve them. For this dish, I added a little re-hydrated TVP (textured vegetable protein) to their stir-fry and served it over buckwheat soba noodles tossed with a little soy sauce and sesame oil. I served mine over shirataki noodles that were boiled for two minutes and then tossed with 1/8 tsp. of sesame oil. They got a little extra protein and carbohydrates while I got a meal that was very light but delicious. This was really good. I used only 1 Tbs of low sodium soy sauce and I didn’t have any mirin so I used Saki. I threw in a handful of raw cashews. We are adding this to our rotation and I shared the like with most of my family. I loved this recipe – thanks for sharing! I have recently started getting fresh weekly produce delievered and my mission is to not let anything in the bag go to waste. When I saw that this weeks bag had brussel sprouts in it, I didn’t know what to do with them. I found your recipe and well….I think that I might be buying brussel sprouts more often! Thank you for making me like Brussels Sprouts! I can’t wait to make them again! This looks terrific but I can’t stand mushrooms. Is there a way to substitute tofu? By the way, I’m not completely vegetarian (yet) but your wonderful website is leading me in that direction. I like how you use a lot of vegetables and do not rely on “fake” meat or cheese. Thanks, Emily! I think you could skip the mushrooms and add cubes of baked tofu in at the end. That would make it more of a main dish, too. This was seriously delicious. I also served mine over shirataki noodles, but threw in some diced baked tofu. 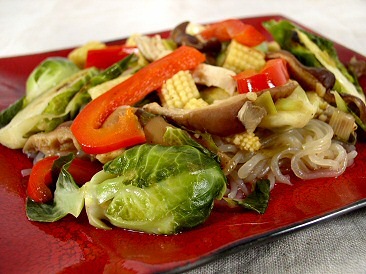 I have never had brussels sprouts in a stir-fry before, but it was awesome. I love your recipe. I have to modify it to be gluten free. FYI, I believe that TVP is NOT gluten free. I know you are not advertising as a gluten free site. It’s just information some people need before hand. A friend found out the hard way after eating sushi. Do you have a cookbook? If you do, how can I get one?